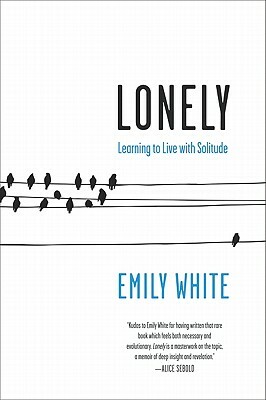 In a boldly honest and elegantly written memoir—the first on this topic—Emily White reveals the painful and sometimes debilitating experience of living with chronic loneliness. In the vein of popular favorites such as Girl, Interrupted and Manic, Lonely approaches loneliness in the way that Andrew Soloman’s The Noonday Demon approached depression, and lifts the veil on a mostly ignored population who often suffer their disorder in silence. Emily White is a former lawyer who now works as a writer and policy analyst. Her work on loneliness has appeared in the Guardian, the Huffington Post, ELLE (UK), the New York Post, and the Daily Mail. She lives in St. John's, Newfoundland. Emily starts the book by describing the feeling of acute loneliness that came over her in painting class. Can you think of a time when you’ve felt really lonely? How did you feel? Did the loneliness go away when your circumstances changed? Emily says that most people don’t want to talk about long-term loneliness. Do you agree with this statement? Why do you think it’s acceptable to talk about states such as depression, but not loneliness? In the chapter called “Taboo,” Emily talks about her difficulties in confronting the shame and stigma attached to loneliness. Have you ever had a conversation where you’ve had to admit to something “taboo”? How did that conversation make you feel? Did you feel better admitting to something, or do you wish you had kept it a secret? Why do you think Emily wrote this book? She talks about lonely people being judged as unattractive and unappealing, but she willingly puts herself in this category. Why do you think she did this? Have you ever aligned yourself with a group that was judged as “marginal”? At the end of the book, Emily has to make a decision about whether or not to leave her friends and family to follow Danielle to the east coast. Have you ever been faced with a decision such as this? Do you think that you could make such a move? Emily talks about the genetic basis for loneliness, with some people being born with a low “set point” for feeling lonely. Do you ever feel as though you’ve been born with a tendency to feel a certain way? How do you respond to this? Does the genetic predisposition frustrate you, or does it make things make sense? At the beginning of the book, and at the start of her relationship with Danielle, Emily tries to hide how much loneliness has been a problem in her life. Have you ever tried to hide a fundamental experience or feeling? How did hiding it make you feel? Did you feel better when you told someone about it, or did telling someone make you feel vulnerable? The end of the book sees Emily leaving Toronto for a much smaller town in Newfoundland. Do you think big cities or small towns are better for people with a tendency towards loneliness? We tend to think of small towns as friendlier, but in what ways might living in a small town be a challenge for someone feeling lonely? Did reading about loneliness make you feel worse, or did it make you feel as though you had company in dealing with a problem that might sometimes arise? In what ways do books like Emily’s offer comfort to people dealing with difficult emotional issues?